For the second consecutive weekend, No. 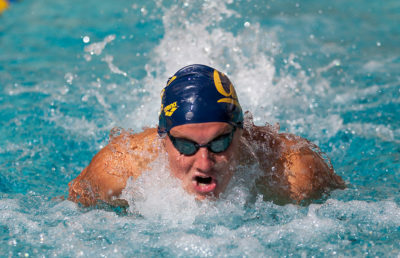 1 Cal men’s swim looks to defend their home waters — this time against a pair of Pac-12 foes in No. 10 Arizona State (2-2) and No. 18 Arizona (1-1) on Friday and Saturday. These are also the final home meets that will take place at Spieker Aquatics Complex in the 2017-18 season. Friday’s dual meet against Arizona State will be the Bears’ first head-to-head conference competition since their resounding victory at Utah more than three months ago. The swimmers got a chance to shake off the rust from a six-week layoff last weekend with the Cal Invitational, a friendly meet featuring swimmers from the East Bay. Arizona State has split its four dual meets thus far, with wins over Utah and No. 20 Florida State in October but losses to then-No. 10 USC and previously unranked Harvard. The Sun Devils’ put up a fight even in their defeats, dropping to the Trojans by only 6 points in November and the Crimson by 12 points. ASU will also have star diver sophomore Youssef Selim, a former Olympian who finished with at least a 60-point margin in every event at the Northern Arizona University Lumberjack Diving Invitational. Like Cal, Arizona has only competed in two dual meets, defeating Utah and losing to USC in back-to-back weekends early in the season. The Wildcats have struggled against the Bears in recent years, losing five consecutive meets. Arizona is led by senior Nick Thorne, who posted the nation’s third-fastest 400 IM with a 3:41.47 swim at November’s Texas Invitational. Cal’s four male divers will also be in action this weekend after a competitive three-day UCLA Bruin Diving Invitational last week. This weekend will feature 1-meter and 3-meter springboard on both days, giving freshmen Jackson Gabler and Jared Kloos a pair of opportunities to earn qualifying scores for the NCAA Zone E Championships. 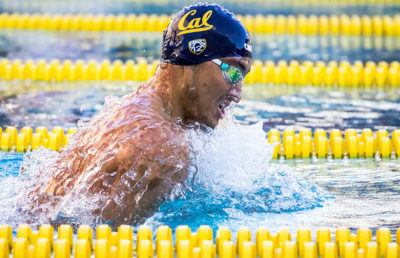 The Bears are headlined by senior Justin Lynch, the reigning Pac-12 Swimmer of the Month, who is part of a group of eight seniors participating in their final home meets. Lynch spent all four years at Cal, contributing to three runner-up finishes at the NCAA Championships through his first three seasons.